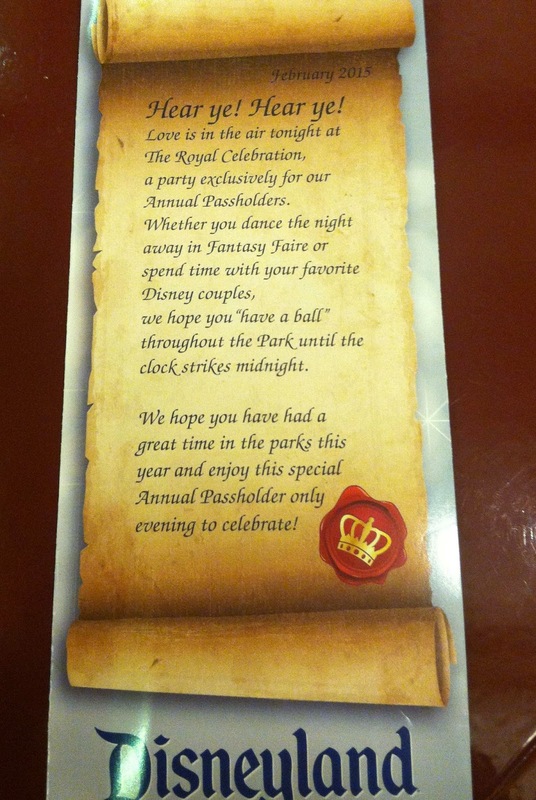 Earlier this week my husband and I enjoyed attending the Royal Celebration Annual Passholder party at Disneyland. The "Royal Celebration" theme was a nod to the upcoming release of Disney's live action version of CINDERELLA (2015). The festivities included a family dance party at Fantasy Faire, where Cinderella's stepmother and stepsisters made an appearance. My husband enjoyed using the camera he received for Christmas and contributed some photos to this post, including this great shot of the Tomorrowland sign. 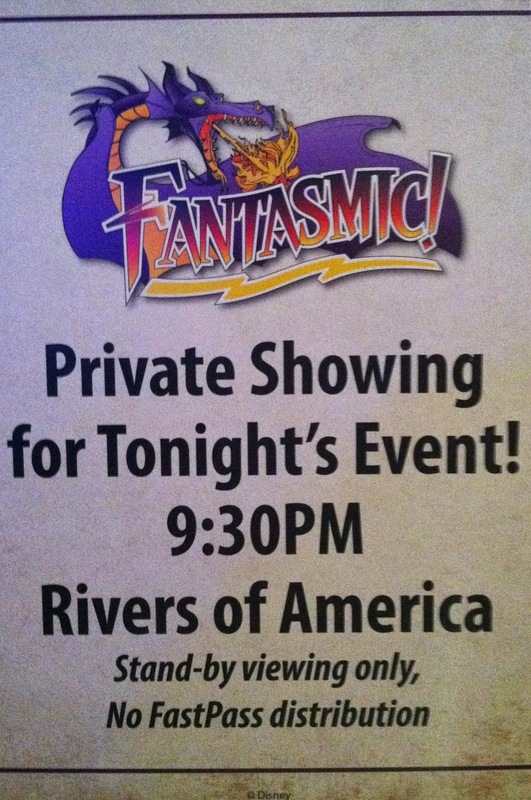 The perk we enjoyed most at this party was a special performance of Fantasmic! with no waiting for seats or need for a Fastpass. 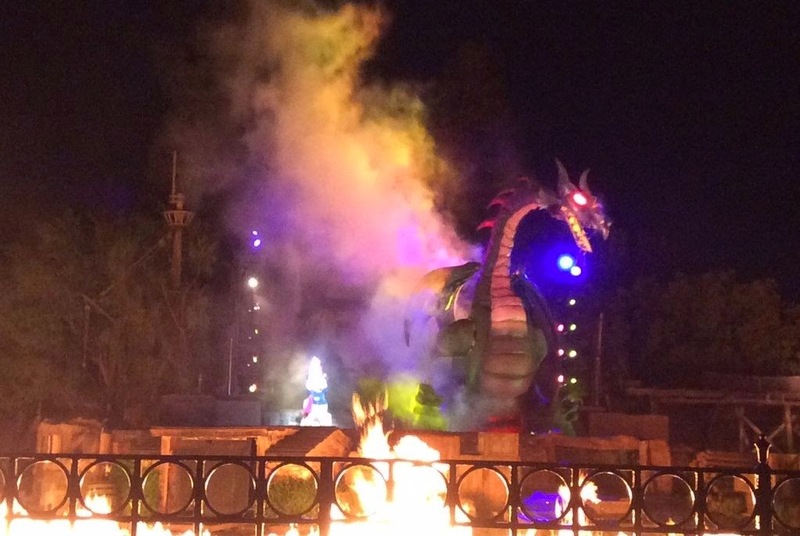 I wrote about the Fantasmic! 20th Anniversary party back in 2012. Nearly 23 years after its debut, Fantasmic! still thrills. 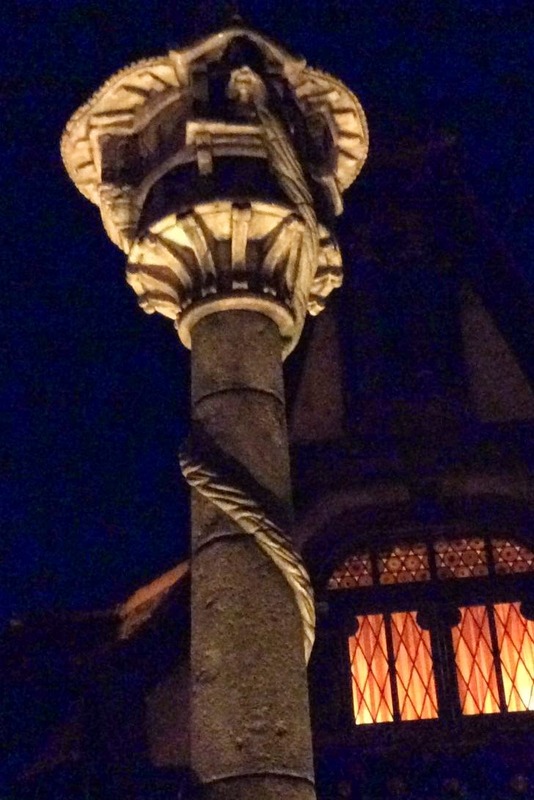 It is endlessly creative, truly one of the best things Disneyland has ever done. I especially love the way the show incorporates both the Columbia and the Mark Twain. Above, Peter Pan and Captain Hook duel on the Columbia (although we noted the usual rope swinging was strangely absent). Murphy, nicknamed the "reluctant dragon" due to his unreliable appearances in the show, was "on" tonight and looked fantastic. My husband also took all the great shots below of Mickey Mouse and the Mark Twain finale. I appreciated his contributions to this post and hope my readers will enjoy them as well. Click any photo to enlarge for a closer look. There are a couple more special Disney events on tap next week, starting with a free D23 preview of the new movie CINDERELLA (2015) on Tuesday and (barring rain) an annual passholder private party celebrating the 20th anniversary of the Indiana Jones Adventure on Wednesday. Stay tuned for additional Disney coverage! I was there also! My friend's Pass fell in the time frame and she invited myself and a couple of others to join her. I had hoped to see the Step Sisters but had no idea they were part of the Fantasy Faire thing. I was there at the beginning but didn't care for the music so I left. If I'd known they would be there, I would have stuck around. I too enjoyed a viewing of Fantasmic - very relaxed and enjoyable. It's been awhile since I've seen the show and I still believe it's one of the best. I plan to be at the 20 year celebration for Indy Jones next Wednesday. Thanks so much, KC! He was happy to hear your feedback. :) He's very happy with the camera -- as am I!